I have been with AOL for the last 6 years and had little to no problems with them but in September due to personal problems my phone line was cut and I had to get a new phone number which when doing so, meant my broadband with AOL was also canceled. 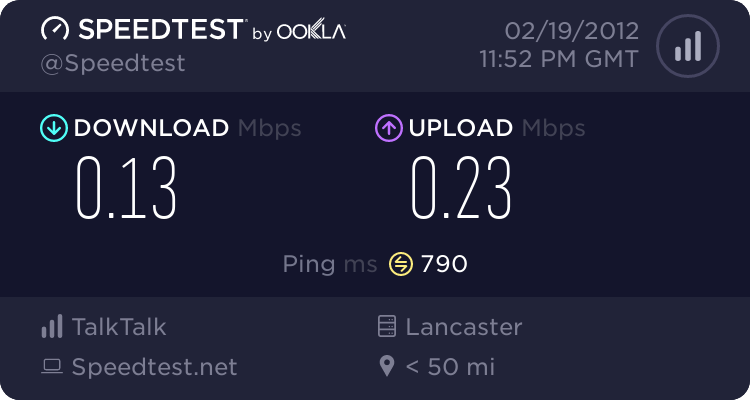 I had to reopened a new account with AOL and since then I have had very poor download speeds. Before my phone line was cut, I was receiving around 3/4mbs download but now I am lucky to even hit 0.5mbs. I have phoned up there support so many times and been fogged off with excuses, been asked to wait while they check my line and been put on level 2 priority. It seems to me that they don't know what is wrong so I was wondering if any of you guys have any suggestions I can bring up next time I phone them up? Also a few weeks ago I was stopped in my village center and told about a faster/better broadband which has just hit my area "TalkTalk LLU" and the guy implied that because I was with AOL, I could switch my account from AOL to talktalk without no charges but after speaking with the sales team at AOL, they said that I would need to pay a cancellation fee. Have any of been able to switch from AOL to TT? Where abouts do I find my router stats? Router I currently have is the one AOL sent me which is EchoLife HG521. Looks like you're on a fixed 512k service, you'd see around 5-7Mb if you were on a better "up to 8Mb" service, or maybe a little higher if on ADSL2+. Edit: I also think that many many years ago, AOL offered to upgrade everyone to an up to 8Mb service for free.. but recall reports of people not being upgraded due to problems on AOL's end. Might be worth asking them what service you are on, and if they state up to 8Mb, question them on this as you're only on the 512k fixed service (Home 500). A friends mum is also having horrendous problems with AOHELL. Orginally she was getting 6mb. they them switched her onto their LLU network and she got almost 10mb for months. A Tree Branch damaged the phone line and after they repaired it the speed dwindled and sometimes she to is lucky to get 0.5mb/s but mostly around 4-6mb. Also her router looses sync sometimes more than 10 times a day and AOL claim that her line is only capable of 6mb max and wont believe the fact she was getting 10mb once. She has tried to get them to release her from the contract she is in to go with sky to see if she gets a better service but they wont, AOL UK since the takeover by The Carphone Warehouse has gone from bad to worse. AMD FX-4100 X4, MSI 990FXA-GD80, 16GB DDR 3 Cosair Vengence 1600Mhz, 6054.81GB Hard Disk Space, 1GB ATI 4670 HD PCI-E 16x Graphics, 850watt PSU. So I just used the BT broadband checker and found something which I don't understand. Our test also indicates that your line currently supports an estimated ADSL Max broadband line speed of 6Mbps; typically the line speed would range between 5Mbps and 7Mbps. If you decide to place an order, a further test will be performed to confirm if your line is suitable for the service you wish to purchase. Please note that postcode and address check results are indicative only. Most accurate results can be obtained from a telephone number check. Note: There is currently a Broadband cease pending or in progress against this line. This cease is due to complete by 2nd March 2012. This will not stop you ordering Broadband from a new supplier, but will delay the provision of the new Broadband service. What does the broadband cease mean? Could this be causing my poor internet speeds ? 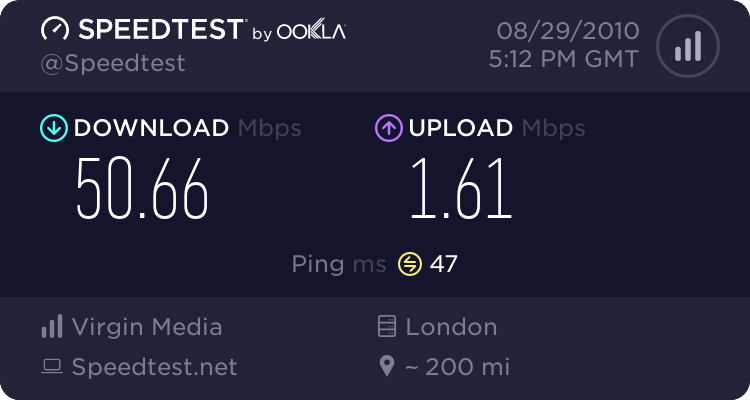 and would I contact BT about this problem? Did you agree something with the TT guy on village green? Did you give him your phone no? Sounds like he may have slammed you! No we never agreed anything and I kinda guessed that he didn't really know what he was talking about, I was just curious if anyone had done that without recieving a canceling fee. So I just got off the phone with AOL and I think the only way I will get this sorted is by contacting ofcom. First guy I got put through to said that I have the incorrect package on my line (up to 8mb) so he connected me to the sales team but I was cut off. Phoned back again and this time selected the sales team and the person didn't know what the other guy was talking about because I have the (up to 8mb) package already on my account. So I thought it might be a problem with the information showing up on the sales team system so I redialed and this time went through to the support guys who also didn't know what the original guy was talking about. So now I have been left with the advice of leaving my router plugged into the test socket for 4 hours then I have to phone back but I have already done this 2 times before and my speed hasn't picked up one bit.